The surveys are sent to the top senior management of organizations in Finland. – To Public sector, and Businesses. 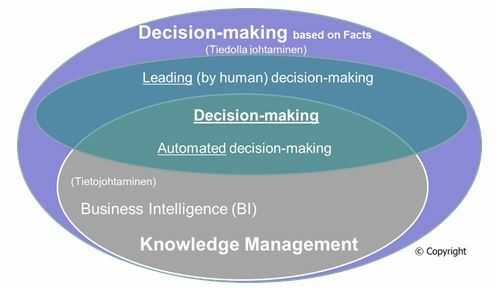 Reference framework, in which these two surveys are related, is extensive, or we could say multi-dimensional – interdisciplinary research and development area – which is dealt with, business administration, organizational research, education and psychology, information and computer science, among other things – in Finnish we can call it tietojohtaminen and tiedolla johtaminen. These definitions are difficult to translate directly. In some contexts, knowledge management can be used. What does this mean then? 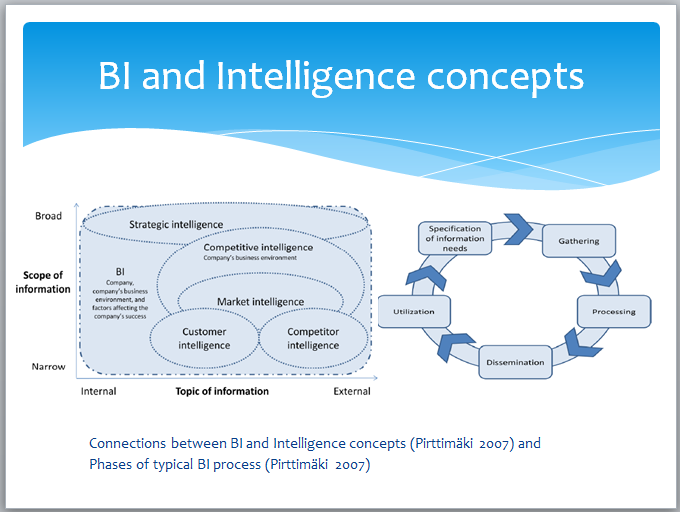 – In the figure (above) I analyze knowledge management and business intelligence within each other, separately. Business Intelligence is producing information, for example, that is used for benchmarks and reports, and it includes various governance models to manage information, and development, and architectures. – Then there is leadership, separately. I have also drawn decision-making separately (above). I think this makes it easier positioning actual decision-making. – We can divide decision-making, for example, to the actual leadership (by human) associated with the following actions, and then we can think separately the needs for data and information for an automated decision-making solutions. In fact, this clarifies the situation significantly, when discussing where information is to be used. – Data does not lead. And the system or technical application does not lead. The Human leads. We do not lead, for example, customers, and we do not lead actual customer experience at all. We are leading the decisions we make. 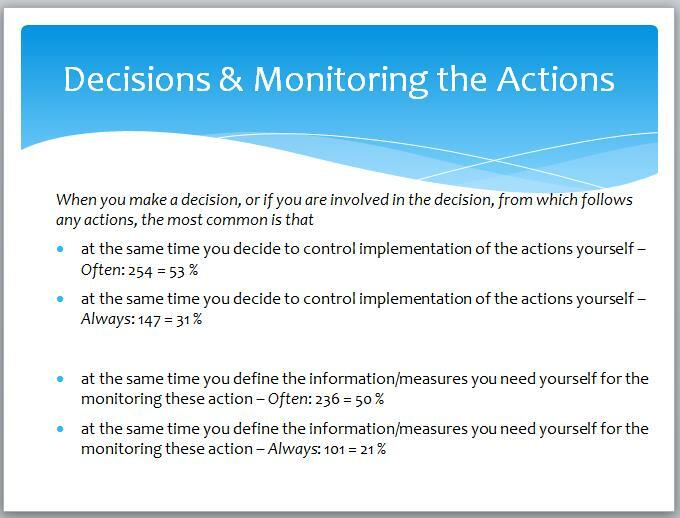 – Information can be used to automate decision-making. However, we do not automate the leadership, carried out by the people. – So, all decision-making is not leadership. Now, when we say that business intelligence to provide better information for decision-making, we can better define the object – an application, or a human being. 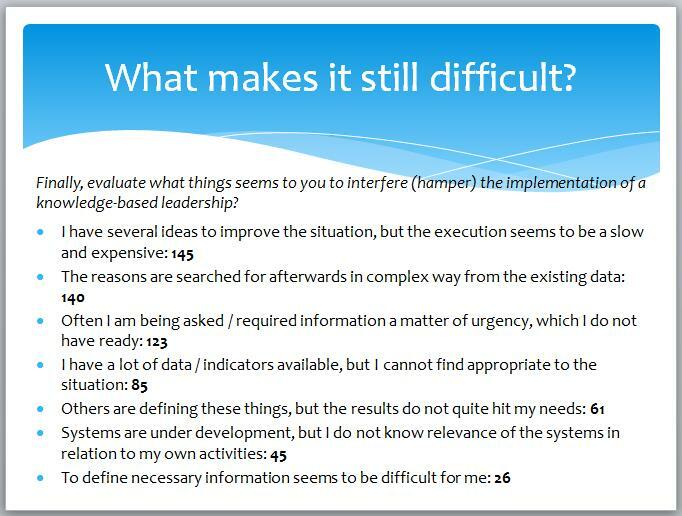 I want to stress (the picture above) leadership as active execution of decisions and the following measures and actions. The vast majority of today’s “management by knowledge” specifications includes some level measures and needs derived from strategy, but leaves open that the actual leadership consists of series of actions. Business Intelligence is seen as one phase of specification and requirements, followed by implementation which “deep-dive” into business intelligence and data management processes. – As a result is desired to provide better information support for the management. These surveys and studies open the senior management perspectives on knowledge management, their vision of the future development, how they experience certain matters mentioned in the survey, as well as how these are present in decision-making, in the organization. 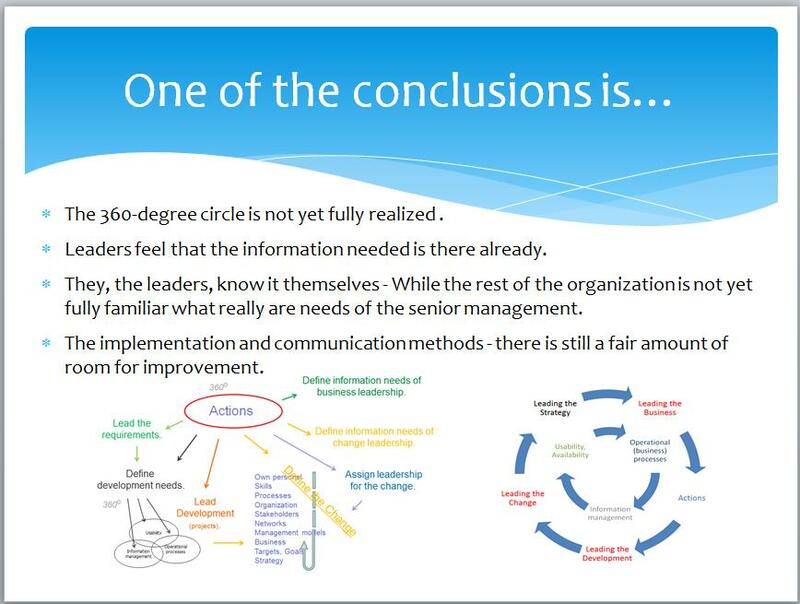 – The latest, second study opens how follow-up data, measures, KPIs (meaning: key performance Indicators) and changes and actions are linked to knowledge management from management and leadership perspective. So – as mentioned in the beginning – The surveys have been sent to the top senior management of organizations in Finland. – To Public sector, and Businesses. For the first study I have almost 400 answers and for the second study, so far, the answers are almost 500. The first study brings the biggest surprises related to the reputation and importance of the trendy issues. – Knowledge management in leadership (Tiedolla johtaminen), customer experience and customer experience management, and the digitalization are likely to be very supportive for communication as the best known. – At the moment, especially the trendy Big Data is still not very clear to senior management. 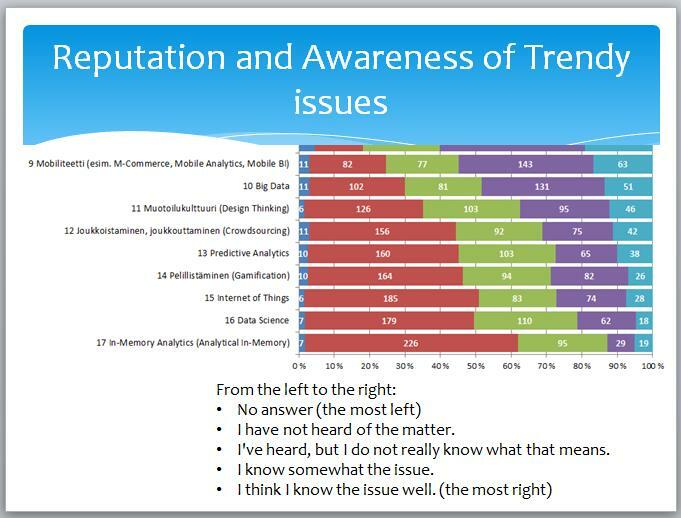 Likely to be particularly poor communicative matters are trendy in-memory-based analytical solutions, data science, gamification and Internet of Things or Industrial internet. Awareness and importance of issues seem to go hand in hand. 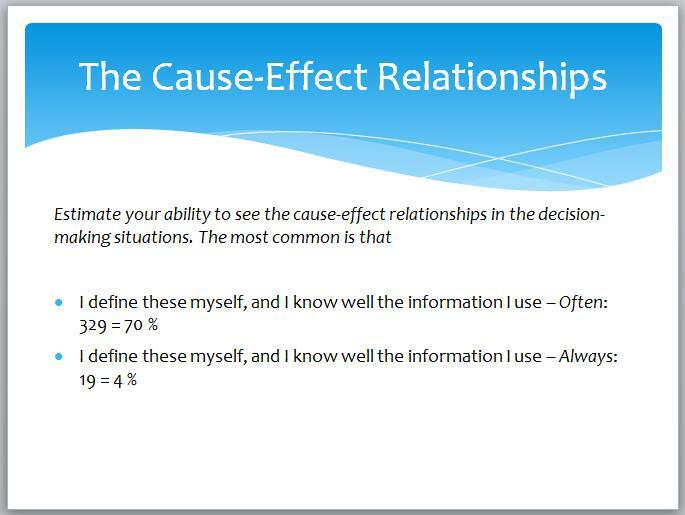 It can be seen that the awareness will first increase, then also interest to the matter starts to increase – and later also the matter begins to affect the decision-making. First the respondents are asked as orientation the question – Think about the most recent independent decision-making situations and group decisions. How do you rate what extent decisions are made based on background data and information, and what extent based on the emotion, feeling and touch? 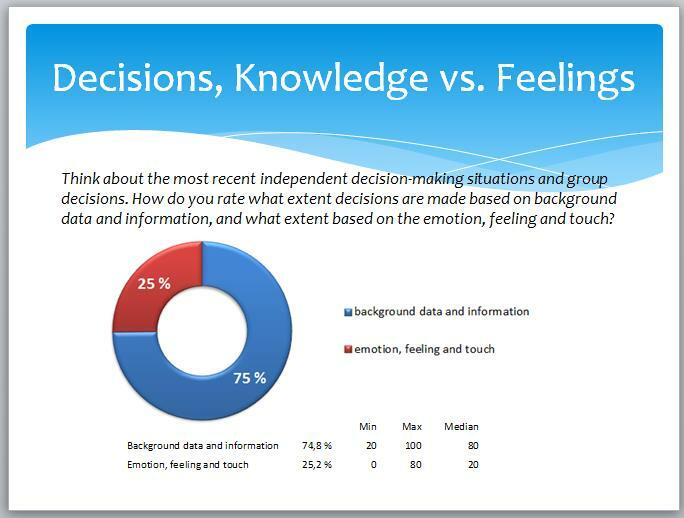 On average, nearly 75% say the decisions arising from background knowledge and emotion and feel have only about 25% significance. Within the public sector to more than 80% of the respondents estimated the decisions been based on knowledge. – The range is significant, as can be seen. 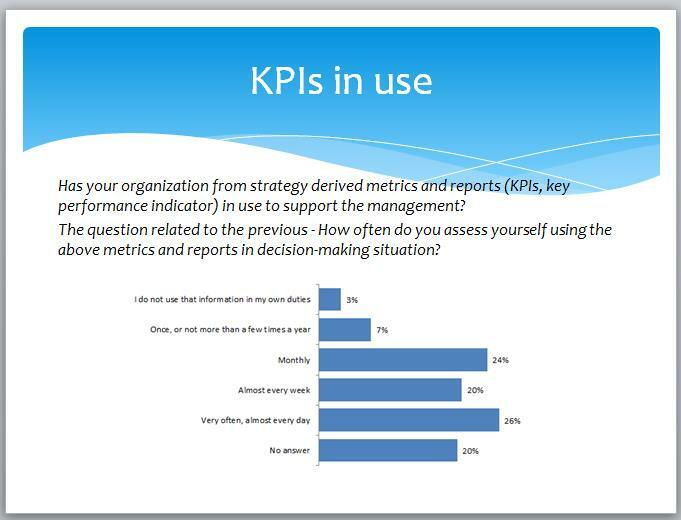 The KPI reports are also in active use when the decisions are made. Also – 199 of the respondents, 42%, said he/she being also personally involved in defining these KPIs several times a year. So – Is everything ok then? – Or do we have some issues to solve? 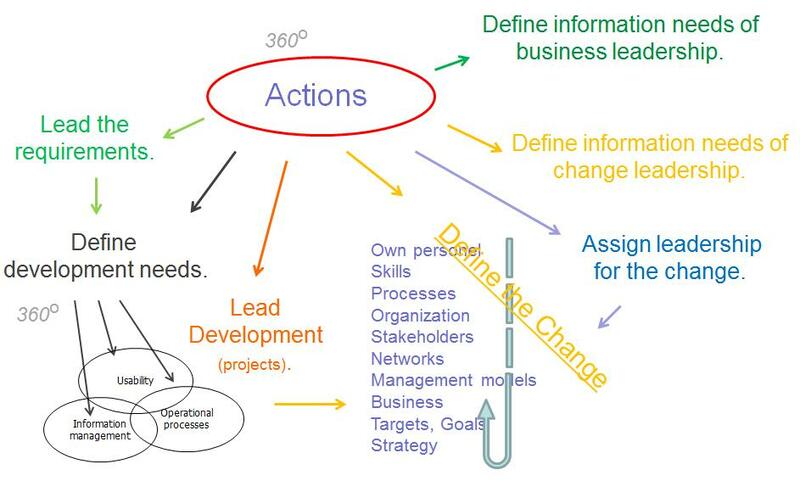 This approach, which I have in my mind, is based on the development of information management obtaining closer to daily decision-making situations – to those situations, where managers now say they know what they do, based on information, and they already know what kind of information they will use to follow up the actions and changes. Currently the prevailing approach is probably at first to start a development project, and then will take place to ask the questions from users what information they need – and then we get a very poor feedback, because the question is difficult, too general, and not connected the decision-making situation. The quality of the questions is poor – not because the questions were wrong – A situation where we submit our question is wrong. And, sometimes it is difficult to determine the right moment to the question. Perhaps the information could be passed without special question. This is one mode of operation and change, to which I shall find answers in the future. Lönnqvist, A., Blomqvist, K., Hannula, M., Kianto, A., Kärkkäinen, H., Maula, M. & Ståhle, P. 2007. Tietojohtaminen tutkimusalueena. Pilot Kustannus Oy. 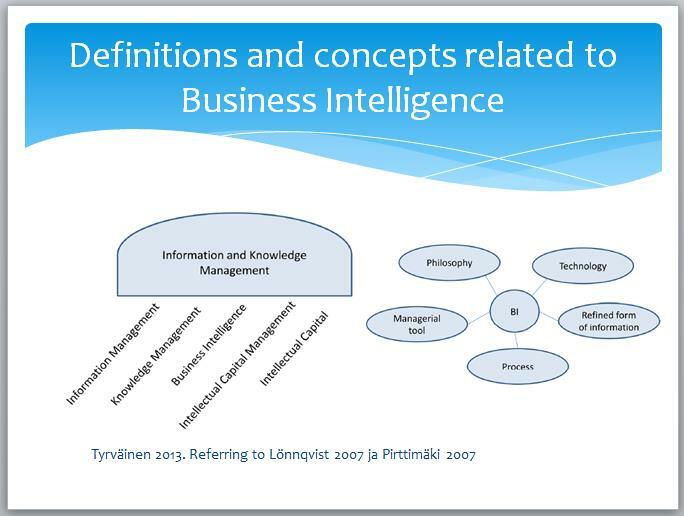 Pirttimäki, V. 2007. Business Intelligence as a Managerial Tool in Large Finnish Companies. Publication 646. Tampere University of Technology, Tampere. Tyrväinen, T. 2013. 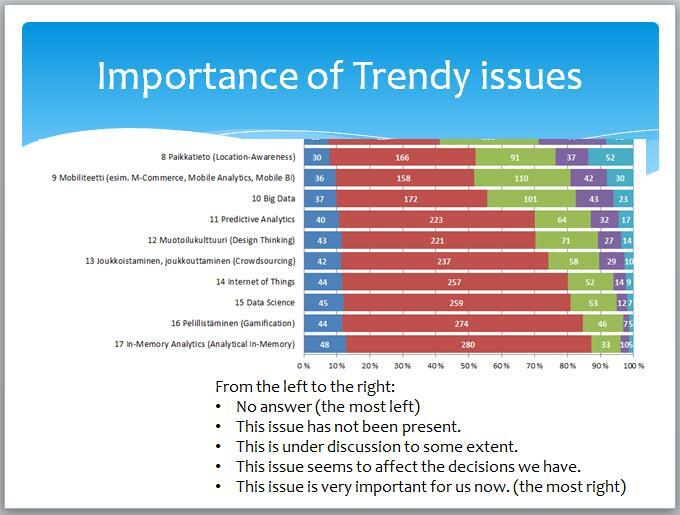 Diplomityö Business Intelligence Trends in Finland in 2013. Tampereen teknillinen yliopisto. Verkko-osoite: http://URN.fi/URN:NBN:fi:tty-201403121127. Petri Hakanen is knowledge management specialist with more than 20 year experience in Business Intelligence, data and information management and supporting organizations to develop fact based decision making capabilities. Petri acts as an entrepreneur for BBI Group Oy and Petri Hakanen Oy.